Rainbows are my favorite thing, like, ever. 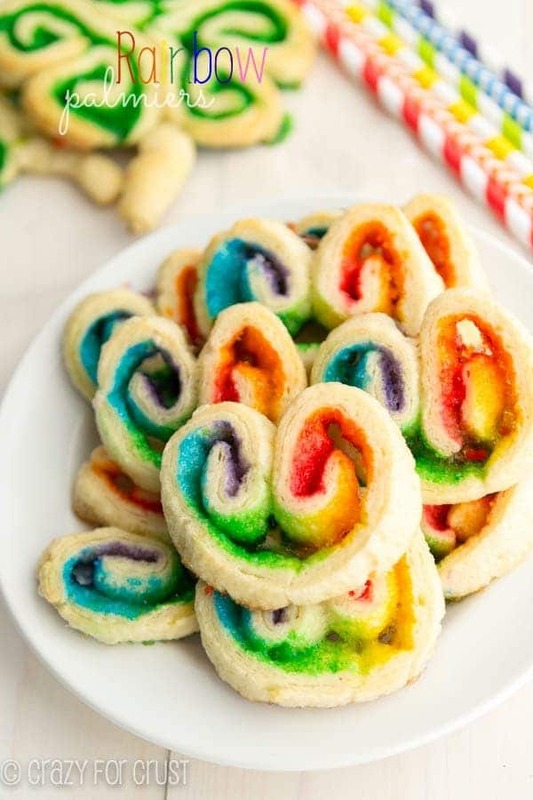 These Rainbow Palmiers (and shamrocks too!) 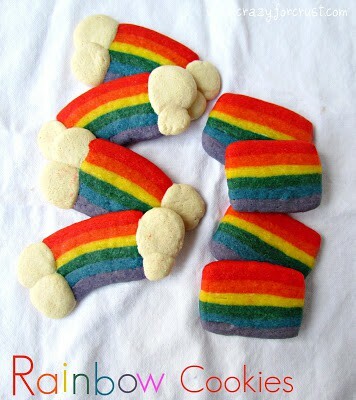 are so easy you will love rainbows too! I want a rainbow birthday party when I turn 40. I want rainbow decorations and rainbow balloons and rainbow costumes and rainbow food. I mean, if I did have a rainbow party (albeit a grown up version of Jordan’s party) I would have to have all the bells and whistles. I’d want a rainbow cake, rainbow cookies, rainbow martinis, rainbow…everything. So I’d probably have to make the food. I mean, I don’t see my husband breaking out the food coloring to make cupcakes, do you? But I do have a rainbow treat he could make. It’s man-proof. And kid-proof. And perfect for St. Patrick’s Day! 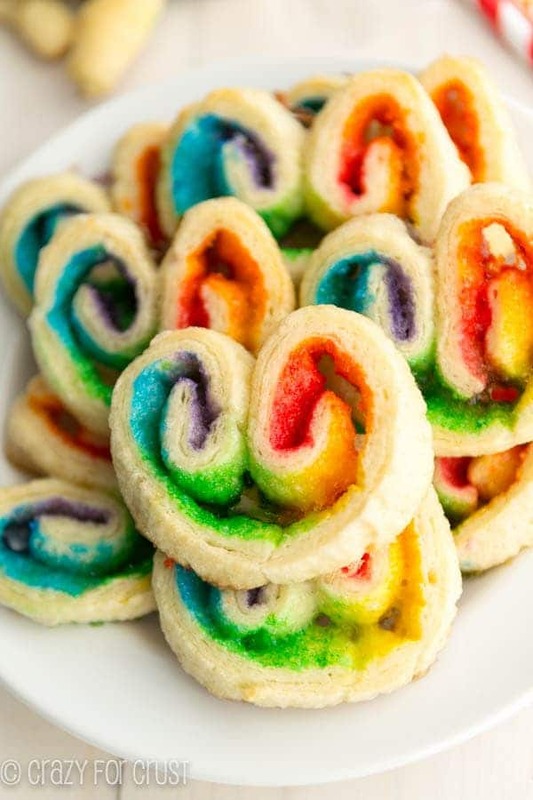 Rainbow Palmiers: the easiest rainbow treat ever. I’m serious: these are so easy you’ll want to cry. Don’t believe me? I’ll show you. You start with Pillsbury Crescent Rolls. Remove them from the can and separate them into two rectangles. (Or buy the Crescent Roll Sheets). Pinch the seams together and cover one side with granulated sugar. Flip them over and cover the other side with rainbow sugar. Or use your favorite colors! 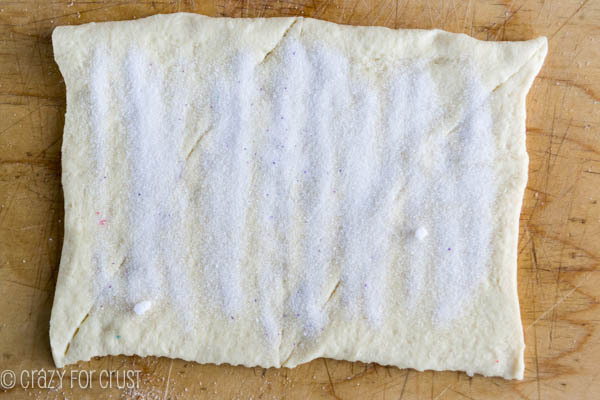 Once you pat down the sugar so it slightly adheres to the crescent roll, you roll up the dough from the left and right. The rolls will meet in the middle. Then you wrap them in plastic, chill for at least an hour, slice, and bake. These come out so rainbow-y and pretty! And, they taste like sugary palmiers. You could totally make them four leaf clovers but I figured three was enough. They are pretty big and if your kid is anything like mine they don’t take to “you can have half” well. So I went with three-leaf clovers. 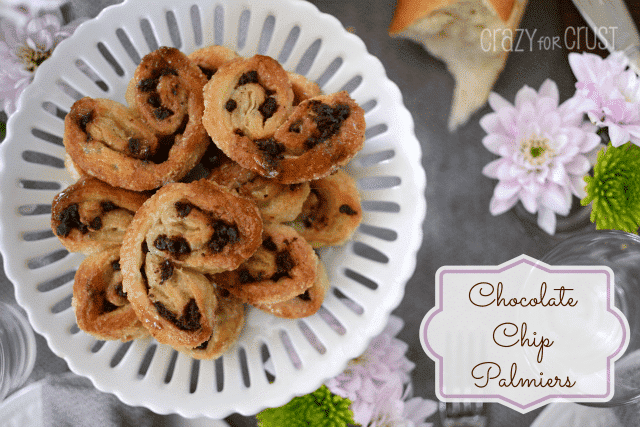 These rainbow palmiers (or shamrocks) are perfect for a breakfast treat, and after school snack, or a dessert! They’re also good for a classroom snack: they’re a little sweet without being overly so and they’re pretty too. I swear, I want to live in a rainbow. 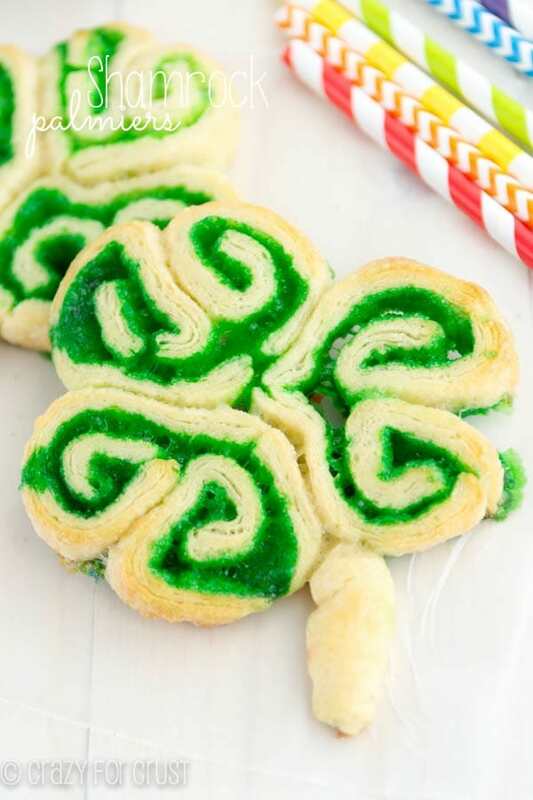 Turn crescent roll dough into a palmier that's a rainbow or a shamrock! 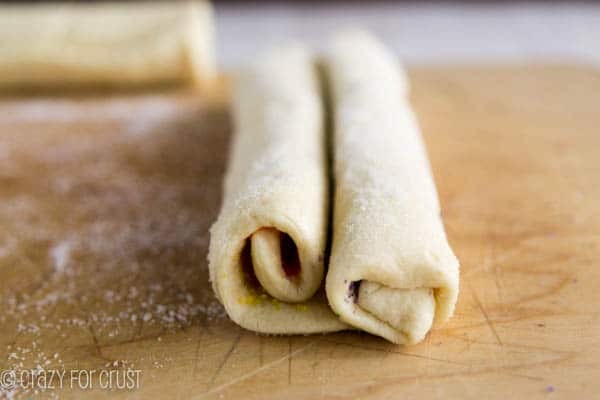 Open Crescent Rolls and unroll dough. Separate the dough into two rectangles along the perforated edge (4 triangles to a rectangle). Working on one rectangle at a time (half the tube), press all the seams together to seal. Sprinkle 1 tablespoon of granulated sugar over one side of the crescent rectangle, press lightly with you hands to adhere. Gently flip over the rectangle. To make rainbows: Place the rectangle so that the width is longer than the height. 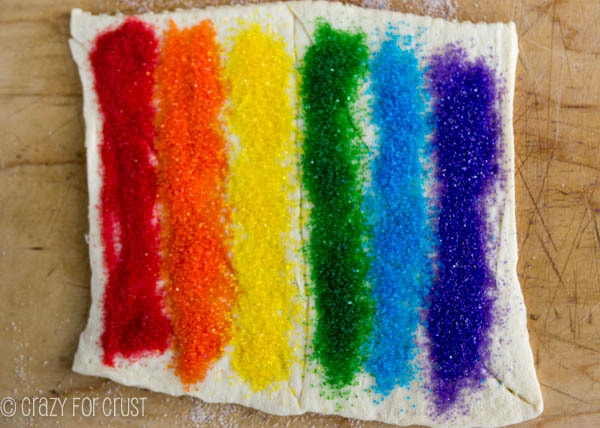 Sprinkle sugars in vertical rows in the colors of the rainbow: red, orange, yellow, green, blue, purple. Roll up each side so that the two rolls meet in the middle. Wrap in plastic and chill for at least 1 hour. To make shamrocks: sprinkle green sugar (about 1 1/2 tablespoons) all over the dough. Press lightly with your hands to adhere. Roll up each side so that the two rolls meet in the middle. Wrap in plastic and chill for at least 1 hour. To bake the rainbows: Slice the dough 1/2” thick. Place on cookie sheets, 2” apart. Bake for 7-8 minutes, until the bottoms start to get golden. Let cool on cookie sheet for just a few minutes, then run a spatula underneath so the melted sugar doesn’t stick. To bake the shamrocks: Slice the dough 1/2” thick. Reserve one of the end pieces, and cut it into four “stems”. Place 3 slices on your cookie sheet, pressed close together in the shape of a shamrock. Bake for 4 minutes, then add the stem to one side of the shamrock. Continue baking for another 4-6 minutes, until the bottoms start to get golden (a total of 8-10 minutes baking time). Let cool on cookie sheet for just a few minutes, then run a spatula underneath so the melted sugar doesn’t stick. Serve for breakfast, snack, or dessert! 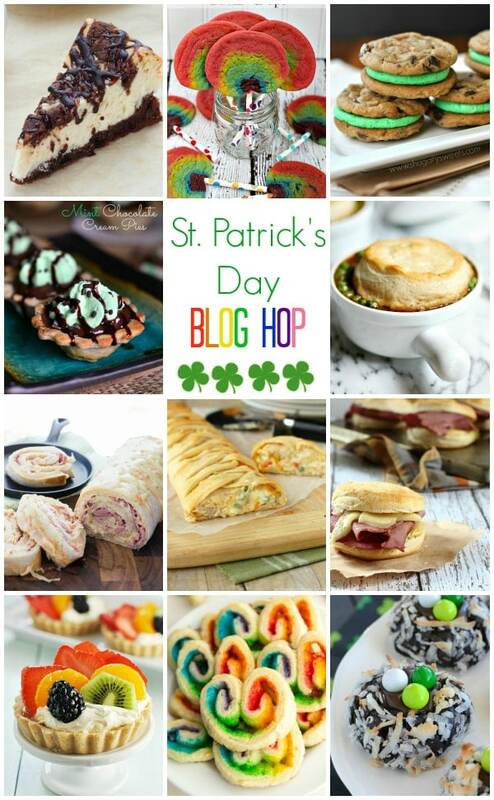 This recipe is part of a St. Patrick’s Day Blog Hop! I loveee this idea, amazing. Going to be linking your blog/this post in my blog post tonight. Thank you for the wonderful idea!